Pink and Mint are the new Christmas Red and Green. I couldn't be happier. Don't get me wrong: red and green and gold as well are still right up there in my Christmas colours cupboard, but there is something about this combo, with a little silver bling for a punch, that I love. I showed you the flimsy that was a near-fail a few weeks ago. I'd not followed my own tutorial instructions closely enough, and had incorrectly oriented the large tree blocks. The mug rug would have been rather tall and skinny as opposed to a nice rectangle. However, all was not lost as I had the idea to add the sashing strips as a frame, and voilà! 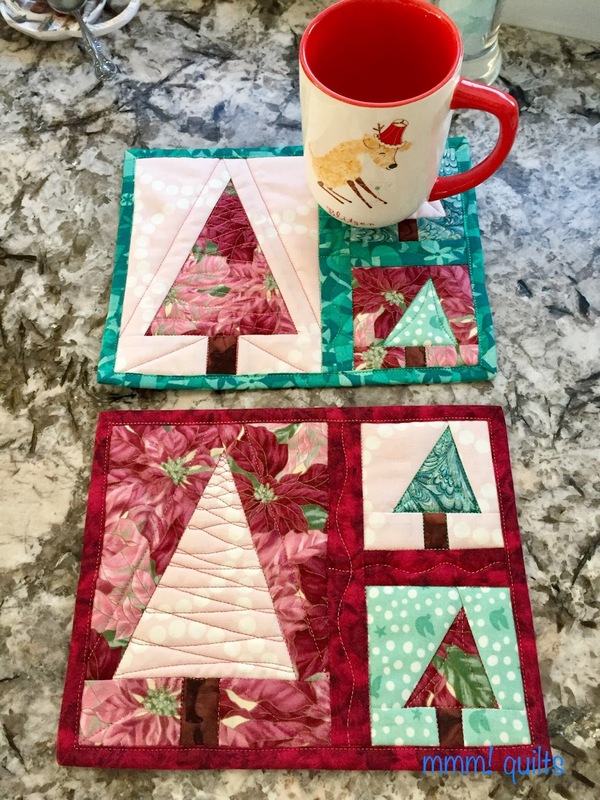 A new spin on my Leaning Tree mug rug. You can find the original tutorial here. Both of these have been given away (it feels awkward in my lingo to say 'have been gifted'), one to one of my yoga students who knitted me a pair of yoga socks (they're da bomb), and the other to a person who reads this blog, so mum's the word until they arrive. The pink and mint poinsettia fabric is an old, er, vintage one from Hoffman that I love, not much left of it now. The other pinks and mints and the burgundy are leftovers and scraps from other projects. Wait, the crystal-looking green one used as sashing and binding in the top mug rug is a fat quarter from JoAnn that I picked up a couple of years ago. These mogul pines make a very Christmassy backdrop don't they? This was pre-snowmageddon a week ago. You'd never know it today though; it's nearly all gone. Used my mmm! quilts labels from Ikaprint of course. No affiliation (but buy through Lorna of Sew Fresh Quilts, as I did, if you wish to support a blogger), great labels and great service. I used Sulky Holoshimmer threads again to quilt these with both my walking foot and free-motion foot for FMQ. It's so difficult to show off the sparkle of this thread which is flat like a ribbon. I laid them on the grass to catch the later afternoon sun and so this does give you a better idea. Two tips when sewing with this thread: 1) use a Metallica needle (I like Schmetz) and, 2) feed the spool horizontally, set up away from your machine. Here's an inside, 'working' photo! You also see the shimmer of the thread in this photo too, and that they are rectangular, not wavy, lol and lie flat! Do you notice the beach glass in the vase at the top of that photo? Well I put some more to work, making another bowl. I'll write more about the process in another post. This one is quite large, 9.5" diameter but only 2 3/8" high. Below, it was nearing completion. I love the various shades of the beach glass, white, several shades of seafoam, mint, light pinkish/purplish, green, and very rarely, brown. You use another bowl for the mold. This one I tried what my friend Elaine suggested, Press 'n Seal. I was trying to avoid the creases I got when I used Saran wrap on the first one. It did go quite a bit smoother, but the bowl was larger and not as sharply slanted too. However, I got the imprint including words and dimples(!) off the Press 'n Seal. I'm sure it will come out with the Dremel. I must say these are rather addictive, like a jigsaw puzzle! While I was in Florida, MacGyver did the tiling for the backsplash. He did such a nice job! All the grout is done now. He put spray foam between the window and frame to seal it up (previous owner had this one installed and it was um a tad drafty) and then he'll put up the casing. He's building some shelves of reclaimed barn wood on the sink wall, once he does some recon to find the wood he wants. Pretty soon I'll give you the before and after final tour of the kitchen. 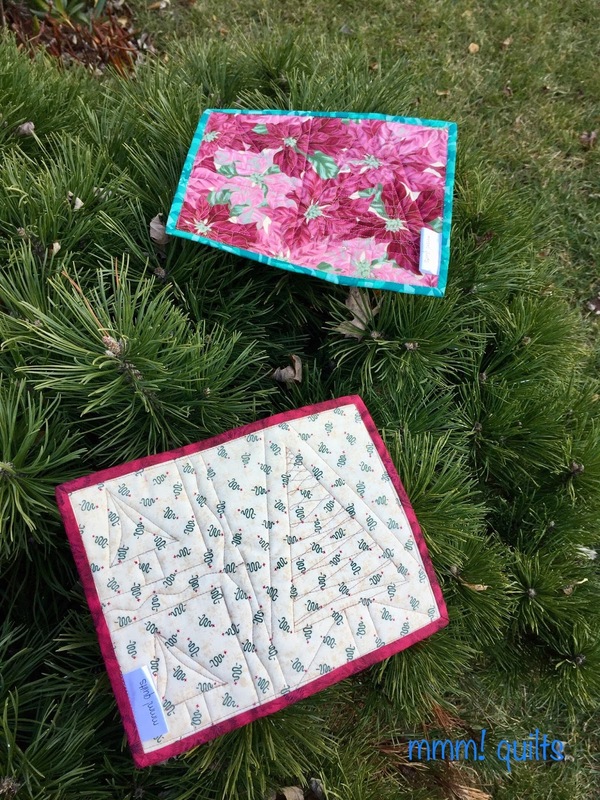 Your mug rugs are so much fun in the new red and green, and in silver instead of gold! Your new fruit bowl looks wonderful. Lovely colours. Enjoy! Leaning trees are lovely, the tiles are super, green masking tape??? And the big question? will you have snow for the 25th? Your mug rugs are adorable! 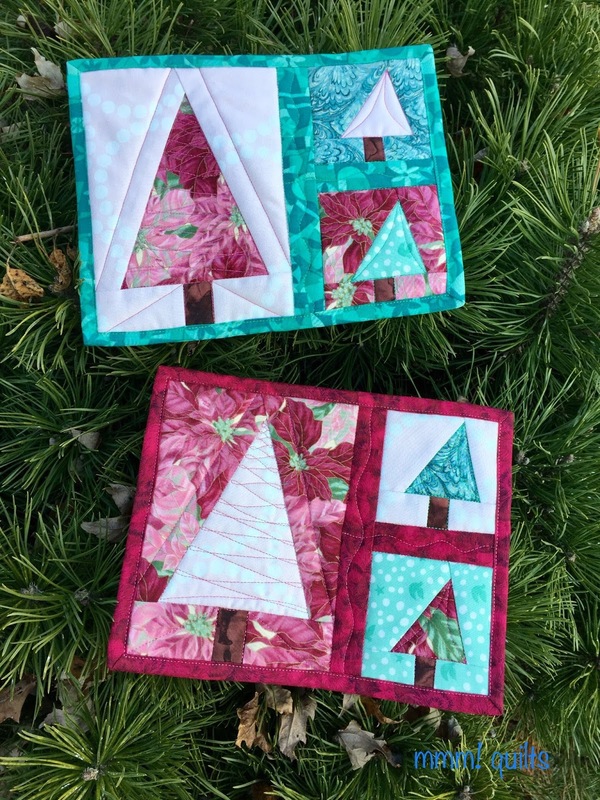 Cute colors and a lot of whimsy in those trees! Love 'em. The mug rugs are delightful and I bet both recipients will be thrilled with what they receive. Your kitchen is looking delightful. My husband is feeling better each day and today pampered me and worked around the house a bit for which I am deeply grateful. And as I type this, we are getting some snow flurries, but I'll be surprised if it sticks. Those are pretty, and such fun colors! I made four of them from your mug rug tutorial, and love how they turned out. And your kitchen is looking great! Beauties all around, mug rugs, glass bowl and the lovely backsplash! I love that new Christmas color combo-so cheery. Your beach glass dish is even better than the last one! 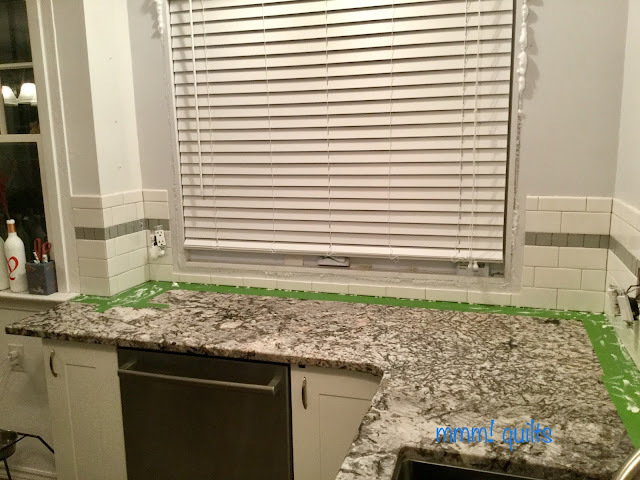 Looking forward to seeing the whole kitchen, I certainly love the counter top and backsplash. The mug rugs are adorable and the bowl-well that is just clever! I have to agree - the pink and mint are awesome! That glass bowl is pretty cool, too. 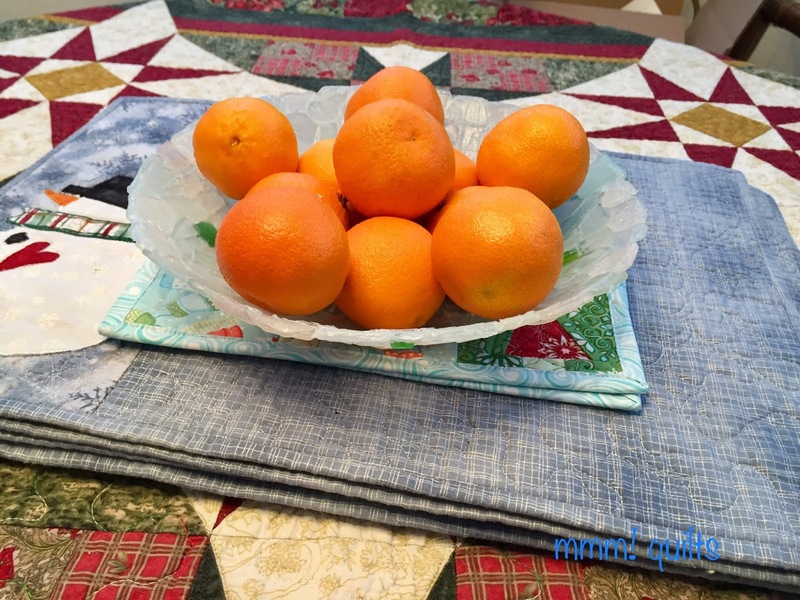 Love your mug rugs and that you used shimmering thread for the quilting is so much fun. So great when it cooperates with your machine, too. Love the sea glass bowl, I may copy you as I love sea glass. I had a whole jar of it when we bought our cottage, but wasn’t sure I’d do anything so I gave it away. I have always regretted it! Love your tile work! We saved a lot on heat in Maine last year after our windows were replaced and insulated. Merry Christmas and Happy New Year to you and yours. I love the idea of the beach glass bowl. How lovely! OOPS! .. one problem solved and the Press 'N Seal created new ones! Darn that friend and her suggestion!! 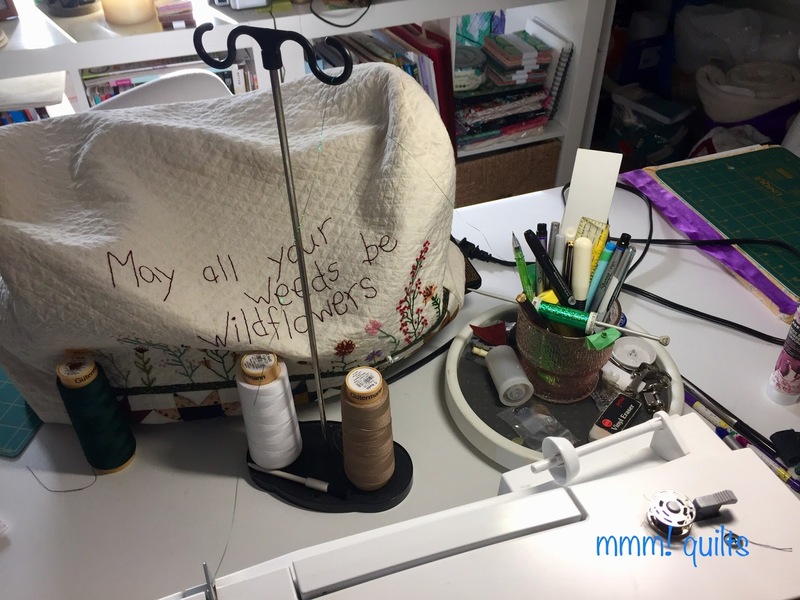 :) The bowl looks fantastic, and like quilts, remind yourself that others will not notice those "flaws" the same as you do, and will only see them as design elements. Maybe? All the same, that Lake Erie beach glass looks terrific! Merry Christmas!!! ...... in the sunny south with your green grass. We're borderline for a white or green Christmas. Those little mug rugs are so cute - I love the colors! Question, though -- why do you have to set up the spool away from the machine? I've never sewn with metallic thread, so I'm curious. Your sea glass bowl is really nice! Love the pink and mint. Mug rugs are so sweet! It's official...your mug rugs are a real hit. I too love the colour combinations. Perfect for gifts. How nice to provide the tutorial. I'm really interested in these sea glass bowls...so pretty. It seems you both are very handy! Lots of crafty goodness here! The mug rugs are very sweet and modern in that color scheme. The mint goes well with the beach glass, so these are beachy Christmas colors for sure :) And MacGyver's tiling is fab! The mug rugs turned out beautifully! And so did your new sea glass bowl. Hope you are snuggled in and ready for the lead up to holiday this weekend. 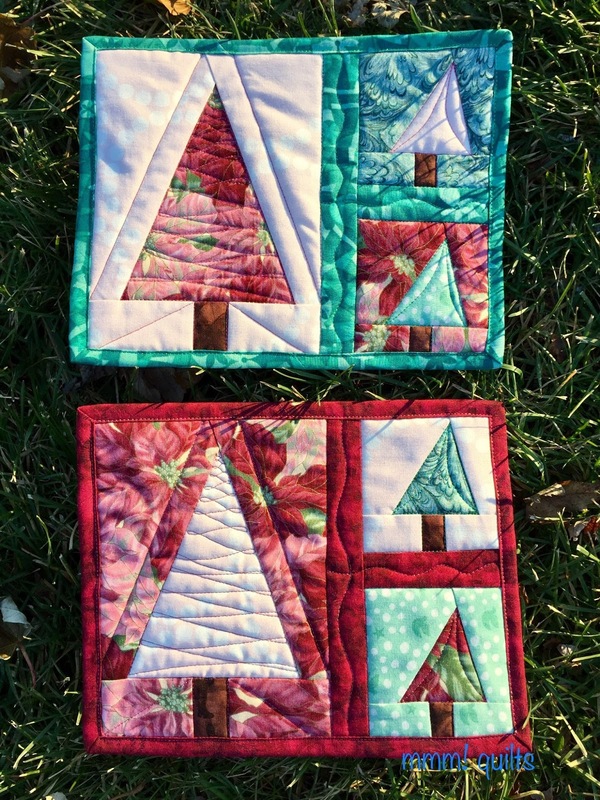 Love all the projects, quilted and not. The sea glass bowl is entrancing....but no sea glass in Nevada!! Ha, ha! The kitchen is looking great. Have a Merry Christmas! Yes, I think Pink and Mint are great colors for Christmas. Your mug rugs are sweet but what caught my eye is the backing on the bottom rug--it is one of the first fabrics I purchased for Christmas and that was almost twenty years ago. 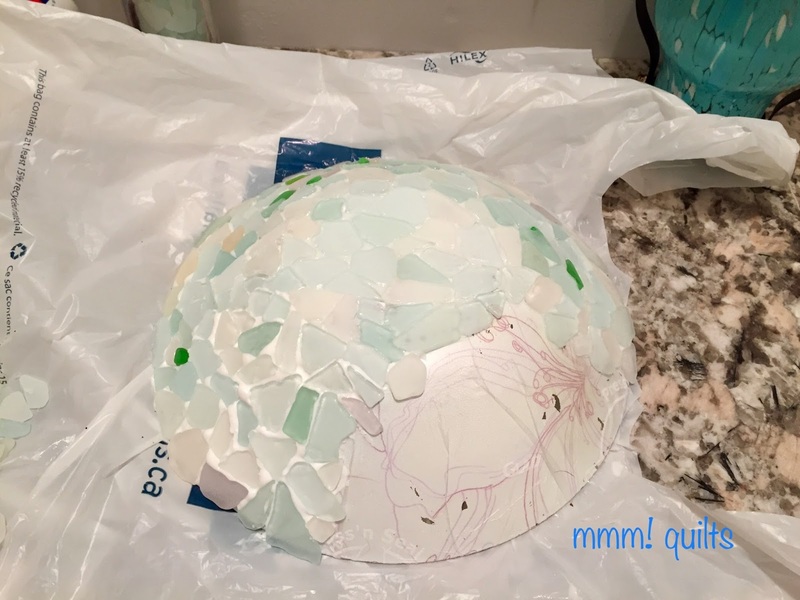 Your sea glass bowl is so pretty and it goes well with the kitchen. Merry Christmas! Love the mint and pink mug rugs, and am most fascinated with your sea glass bowls and how strong they seem to be once dry. So pretty! Your mug rugs make me think of peppermint nougat candy. (Now my mouth is watering. It’s neat to see your bowls in use. I liked the first one a lot, but the shallower version really grabs my attention, too. It’s perfect as a fruit bowl. Your kitchen is looking so fine, it might be hard for you to leave it. Nah, I know you enjoy the warmth of Florida. And the kitchen will be all fresh and new when you get back again. Cute mug rugs. Thanks for the tip about how to use the thread. Love your sea glass bowl. Very cute mug rugs! Merry Christmas!